The latest addition to the Oris BC4 Aviation collection is another essential flight instrument, a vital piece of cockpit equipment. This pilot’s watch was created using feedback from the experts from our daredevil aviation partner, the Blue Eagles Helicopter Display Team. Whilst the basic construction and vital statistics of the case and the dial are classic BC4, this watch offers something genuinely new – and it is something not everyone notices at first glance. The Regulateur movement has a centralised, stand-alone minute hand. This makes the minute display even easier to read accurately as the hour and second hands never cover it. Even in times of modern technology and GPS navigation, a watch remains indispensable for every pilot. To carry out his flight plan successfully the pilot measures the time between each waypoint. When the set time has elapsed, the pilot knows he must move to the next heading. The BC4 “Der Meisterflieger” is the ideal companion to the flight plan. The minute numerals on the dial are unique to this Oris model and add to the instrument feel of the watch. The rotating dial ring, operated by the distinctive vertical crown at 2 o’clock can be set to a countdown scale to show a pilot how much time remains before he needs to change his course. 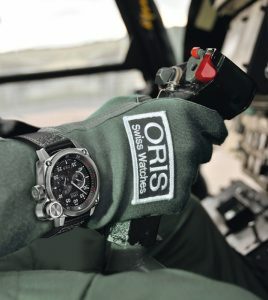 Where accuracy is essential, Oris is on board. Automatic mechanical movement. Centralised minute display. Hour display at 3 o’clock, small second at 9 o’clock, date at 6 o’clock. Multi-piece stainless steel case secured with seven screws. Prominent vertical crown at 2 o’clock (operates moveable minute scale dial ring). See through glass case back. Sapphire glass domed on both sides with inner anti-reflective coating. Two-piece black dial with applied nickel indices and printed Superluminova numerals. Polished nickel hands with luminous inlay. Stainless steel Quick Lock Crown.